Fundraiser by Happy Vail : Hannah's "hot wheels"
Hannah Waterman and her family (Scott, Shelly, and Hadley) enjoy taking bike rides on the Burlington bike path. However, she has only been able to participate by using a bike trailer being pulled from behind one of her family members. One summer during a day at camp, Hannah was introduced to a bicycle that allowed her to ride side by side with her sister. From that point on it was clear that there was a better way for her and her family to ride... together! Hannah has Rett Syndrome and Lennox- Gastault seizure disorder. Rett Syndrome is a rare, life threatening genetic disorder that affects the neurological system. It has a profound impact on speech, hand use, and motor function. Lennox-Gastault Syndrome is also a life threatening intractable seizure disorder. Friends and family of the Waterman's know how much it means to them to spend as much quality time outdoors doing activities many of us take for granted. 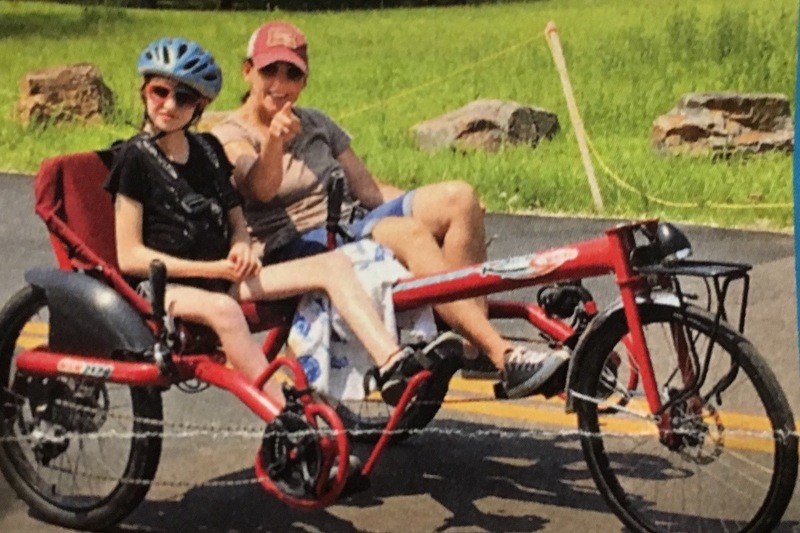 We are asking for donations so that Shelly and Scott are able to purchase a tandem bicycle from Ricksycle.com so that Hannah can see, smell, feel, and experience the outdoors without the limitations of a bike trailer. Thank you so much in advance for your generosity and if you see them on the Burlington bike path or elsewhere cycling around give them a big wave and hello! Hannah's smile is truly infectious!